If you need to efficiently share vast amounts of SEMrush data through a custom interface, we’ve got good news for you. SEMrush Analytical API (Overview Reports, Domain Reports, and Keyword Reports) has had an unprecedented boost in performance and functionality. Here’s what we now offer for easier data acquisition and analysis. 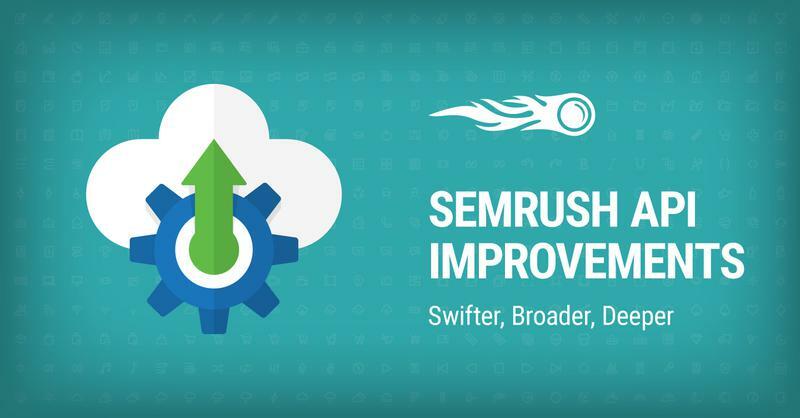 SEMrush API data processing capabilities have improved more than 10X. This means that it will take you 1.6 seconds to obtain 100 000 lines of data instead of 22 in the old version. This speed coupled with our vast databases will give you a significant advantage both in terms of promotion and competition. In the Keyword Reports section we’ve got two awesome new entries: Batch Keyword Overview and Phrase Questions. The first lets you analyse 100 keywords through one request, which streamlines processing groups and comparing keywords. Phrase Questions provides a list of phrase questions relevant to a queried term in the chosen databases, making it easier to find new traffic opportunities for a certain website. And for a more detailed domain overview we now provide total traffic and SERP Features information, letting you find out the SERP Features that a specific keyword exhibits in its search results and check the presence of the domain of interest in any of these in one click. These and other API potentialities are available to all SEMrush Business subscribers at an additional price. The cost of each request is measured in units.